Various transformative ‘moments’ have inspired and stirred debates around land control: the spread of colonialism, the rise of nation-states and nationalisms, the invention and triumphalism of global markets, collectivizations and privatizations. The ‘right’ of sovereign on land has been a contested subject through history. Even in democracies, the exigencies of collective benefit versus individual land rights have been at loggerheads. 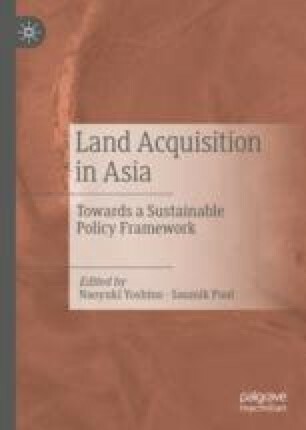 This chapter aims to further the policy framework of a land trust bank in India and presents a case for the creation of an equivalent body in India. It does so by studying the existing legal as well as development structures, and through identification of other stakeholders, it seeks the creation of a third-party body to help facilitate a land transfer that is beneficial to the land seller/user as well as developer. Sanyal, J. (2013, April 9). The Land Acquisition, Rehabilitation and Resettlement Bill 2011—A jurisprudential critique. Retrieved from SSRN: https://ssrn.com/abstract=2294079 or https://doi.org/10.2139/ssrn.2294079.